Better Call Saul is a television crime drama series created by Vince Gilligan and Peter Gould. It is a spin-off prequel of Gilligan's prior series Breaking Bad. Set in 2002, Better Call Saul follows the story of small-time lawyer Jimmy" McGill, a lawyer and a former scam artist, who becomes involved with the criminal world, six years before his appearance on Breaking Bad as Saul Goodman. Like its predecessor, Better Call Saul has received critical acclaim. It has garnered several nominations, including fourteen Primetime Emmy Awards, seven Writers Guild of America Awards, five Critics' Choice Television Awards, a Screen Actors Guild Award and two Golden Globe Awards. The series premiere held the record for the highest-rated scripted series premiere in basic cable history at the time of its airing. 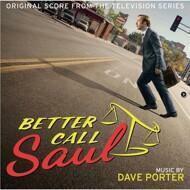 Dave Porter, the composer of the score, has also written the opening theme and complete score of Breaking Bad. For his work on Breaking Bad, Porter has won an ASCAP Award. The Better Call Saul score features songs from the first and second series. The package contains 2 printed inner sleeves with images of Jimmy, Nacho and Mike. It also contains an exclusive 4-page booklet with additional pictures and liner notes. The etch on the D-side is a "certified" replica of Jimmy McGill's law degree he received at the University of American Samoa.